Webkinz Recipe BooTooYoo has been solved! Submitted by cbjhockey on Fri, 10/10/2014 - 2:32pm. A special thank you to WebkinzInsider member dancerchick914 for letting us know the Webkinz Recipe BooTooYoo has been solved. While she can't take credit for solving it, she was the first time point out that an article on the Webkinz Facebook feed contained the ingredients. You can make your own BooTooYou using a Super Stove in the Clubhouse to combine Ophidian Callaloo, Rice Pudding, and a Serpentash Squash. Submitted by MissGnomie on Tue, 09/02/2014 - 2:48pm. Webkinz Newz recently announced that this October's Pet Of The Month will be the Rockabilliy Rooster. Like previous months the Rockabilly Rooster can be purchased in a plush version, or through as a virtual only pet through the Ganz eStore. If you adopt this rocking pet during the month of October, you will receive an exclusive POTM exclusive item to add to your collection. All owners of Rockabilly Roosters will also be able to participate in exclusive activities and events throughout the month. If you are thinking about adding this pet to your collection next month, please consider supporting Webkinz Insider's partner shop: Ameriwade! They feature great shipping rates ($5 to the United States; $8 to Canada), and a great selection of current and retired webkinz plush toys. For further information on the Pet Of The Month program, visit our WIKI page today! Submitted by MissGnomie on Sun, 08/31/2014 - 10:31pm. Webkinz has recently updated their Free Account program for new webkinz users. Previously, any user who opened a new free account could adopt the Webkinz Mutt or Domestic Cat. With this new update any user who opens a brand new Webkinz account will be able to select one of nine eStore pets to adopt. The nine eStore pets include: The Pink Zebra, Ice Fawn, Leonberger, Afghan Hound, Floppy Eared Bunny, Marshmallow Chipmunk, Sun Fox, Wolf, and Cotton Top Tamarin. Members may be interested to know that previously Pink Zebra has only been availble through an eStore promotion. Furthermore, the Ice Fawn is a seasonal winter pet and only available once a year (providing it is released by the eStore). The Leonberger, Afghan Hound, Floppy Eared Bunny, Marshmallow Chipmunk, Sun Fox, Wolf, and Cotton Top Tamerin are all virtual pets and available to purchase by members exclusively through the eStore (note that some may not be currently available as the pet selection rotates through the year). New users who create Free Accounts are limited in their participation throughout Webkinz World. These accounts are unable to access Kinzpost, the trading room, the items they can purchase, how many rooms they can create, and more. Members can remove these limitations through the purchase and adoption of any other Webkinz pet, or the purchase of a deluxe membership through the eStore. For more information on the Free Accounts, Full Membership, or Deluxe Membership options please visit our WIki. Submitted by MissGnomie on Sat, 08/02/2014 - 9:32am. Ganz has announced that the Webkinz Friends and Tail Towns Friends Applications will be shutting down on August 31st, 2014. This closure will affect both the Facebook and iPad versions of the game. While the application was popular with Webkinz Insider members, the application never found a large audience on Facebook or through the App store. Due to the lack of audience the development team experienced limitations in their "ability to add new content and give the game the attention it deserved." As of Today (July 29th, 2014), Webkinz Friends & Tail Town Friends will no longer allow new players to sign up to play via Facebook or the App store. All payments have also been suspended due to the pending shut down. Current players, however, will be able to play as much as they desire as the energy requirements will be removed from the game. The prizes exclusive to Webkinz Friends will be added in due time to Webkinz World, to ensure that all members have the opportunity to enjoy them. UPDATE (August 2nd @ 9:30am KT): We have received multiple reports of ads and news articles within Webkinz World directing members to the Webkinz Friends application. The ad featured on the left instructs WI member FIA to hold on to their pet's secret code in order to participate in Webkinz Friends. Members have also reported seeing daily News updates in Webkinz World mentioning exclusive prizes to be earned on Webkinz Friends. While it may appear that GANZ is promoting the Webkinz Friends iPad app to members, we have no way to confirm that the application's shelf life will be extended in any way. At this moment in time we can only reiterate that, based on the previous update provided by GANZ, the Webkinz Friends application will be shut down at the end of this month. Submitted by MissGnomie on Sat, 08/09/2014 - 9:24am. Thanks to the two hints provided during the #OneWebkinzWorld bonus challenges, WI member Starburst1425 for sharing the Neon Tutu recipe! According to Starburst1425, this Recipe calls for Pink Cowgirl Boots (Friday's #Onewebkinzworld hint), Fall Floral Skirt (Saturday's #Onewebkinzworld hint), and the Thick Knit Sweater. Give the recipe a try and enjoy this chic new tutu on all of your lovely pets! Thanks to Starburst1425, and thank you to our dedicated recipe solving community here on WI and throughout Webkinz World. And don't forget that you can see a list of solved clothing recipes on our WIki at any time! UPDATE (August 10th @ 2:10pm KT): An earlier version of this article incorrectly credited Starburst 1425 for solving the original recipe. While Starburst was not the original webkinz player who solved the recipe, they did share it on our clothing machine recipe thread. Webkinz Community Successfully Unlocks #OneWebkinzWorld Prizes! Submitted by MissGnomie on Thu, 08/07/2014 - 3:16pm. Congratulations to the Webkinz Community and WI Members for unlocking all ten levels of the #OneWebkinzWorld prize package. For completing all of these challenges players have unlocked prizes to be enjoyed by all Webkinz World players on #OneWebkinzWorld play days -- running August 8th through August 10th. 30%, 40%, 50%, 60%, or 70% off specific eStore Pets. and Exclusive Play Day #OneWebkinzWorld themed Items! There are still a few days to participate in the Bonus Goal challenges found via Webkinz Newz. Currently, members are working to unlock the recipe for the Neon TuTu recipe! Congratulations, and don't forget to log in during the Play Days to collect your prizes! UPDATE (August 7th @ 3:15pm KT): GANZ has added 1,000 extra eStore points to the final prize tally as a thank you to everyone who participated. Play Days start tomorrow, so don't forget to log in! Submitted by Electrabuzz1 on Tue, 08/05/2014 - 9:36am. Pictured above, is a quirky new friend that will soon be filling up our days with fun in Webkinz World. Check out the new Quirky Carnival Unicorn! Comfort is the name of the game with this Quirky Carnival Unicorn's PSI, the Quirky Carnival Wagon Bed. The PSF for this pet is the Twisted Candy Apple! Also, coming soon to Webkinz World is the Mystical Crab. This pet loves things that shimmer including their percious PSI, the Wondrous Treasure Bed. The PSF that accompanies this pet is the Surreal Sushi Platter. Please keep your eyes on the Webkinz Insider front page where we will let you know when these new pets are first spotted in Webkinz World! Submitted by MissGnomie on Thu, 07/24/2014 - 9:07am. Webkinz Newz recently announced a new contest running from July 3rd to July 31st. This contest will require members to use various platforms of Social Media to earn points, and collect prizes for the entire Webkinz Community. Members who are registered (with parent permission) on Facebook, Youtube, Twitter, or Instagram, are encouraged to create fun pictures and videos of their webkinz plush toys and share them on these social platforms in order to earn points. These images and videos must include: A tag on the official Webkinz social media accounts using @Webkinz, include the provided banner image, and include the hashtag #OneWebkinzWorld. Additionally, pictures must feature one pet at a time (no group plush pictures). Members are, however, able to enter as many pictures/videos as they would like to create. Those who are uncomfortable using social media, or who do not have permission of their parents, may participate in challenges released on WebkinzNewz.com. These challenges will unlock points towards the many rewards available at the end of the contest. Keep an eye on Webkinz Newz for information on these challenges as they are released. At the end of the Contest Period (July 31st, 2014), the points will be tallied and unlock special rewards for all members of the Webkinz Community. Each photo or video shared will count as one point on each platform shared, there is no word on how many points the challenges will reward when completed. 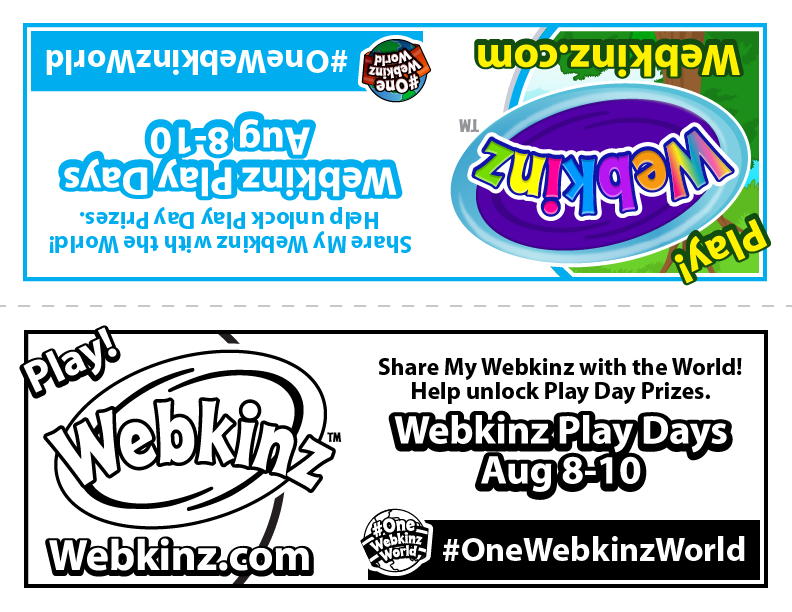 For further information on the rules and regulations of the #OneWebkinzWorld contest, please visit Webkinz Newz. We would like to remind our Webkinz Insider members at this time of our rules on Social Media. We do not allow discussion, sharing, or links to any social media accounts. This includes posting links to contest entries. This is for the safety of our members. Those who participate should also ask their parents for permission to open accounts on any of these websites. UPDATE: ( July 9th @ 6pm KT) The Webkinz Community has successfuly earned 30,000 points in total. In addition to the 30,000 (3rd level) rewards of 1,000 Kinz Cash & Three Jumbleberry Fields Plays, those who log in during August 8th to 10th will also receieve 2,000 Kinz Cash, two wheel extra wheel of WoW spins, and three free spree rolls. Remember, these prizes will not be available until August! UPDATE: (July 14th @ 8pm KT). Ganz has announced that the Webkinz Community successfuly completed the requirements for levels four, five, and six. Members have now unlocked the following prizes (in addition to previous levels): 3,000 kinz cash, three free wheel of wishes spins, a spin on the super wheel, all webkinz world apps downloadable for FREE during play days, and 30% off select eStore pets during play days. UPDATE: (July 24th @ 9am KT): The Webkinz Community has successfully earned 90,000 points in total. This means that users have unlocked the 70,000, 80,000, and 90,000 levels since our last update. Including previous prizes earned, members will now receieve: an additional 3,000 Kinz Cash, Free Melanie Pet Buddy, 40% off specific pets, an Adventure Kinz Backpack, 2,000 eStore Points, 50% off specific pets, Goobers Room Theme, and 60% off specific pets. Remember, that you only have until July 31st to unlock the 100,000 level prizes and unlock the bonus goals (by earning over 100,000 points)! Keep an eye on Webkinz Newz and Webkinz Insider for additional challenge updates! There are currently 0 users and 609 guests online.